King Talys’s name is Mostyn. Michalis, Minerva and Maria’s father is called Osmond. 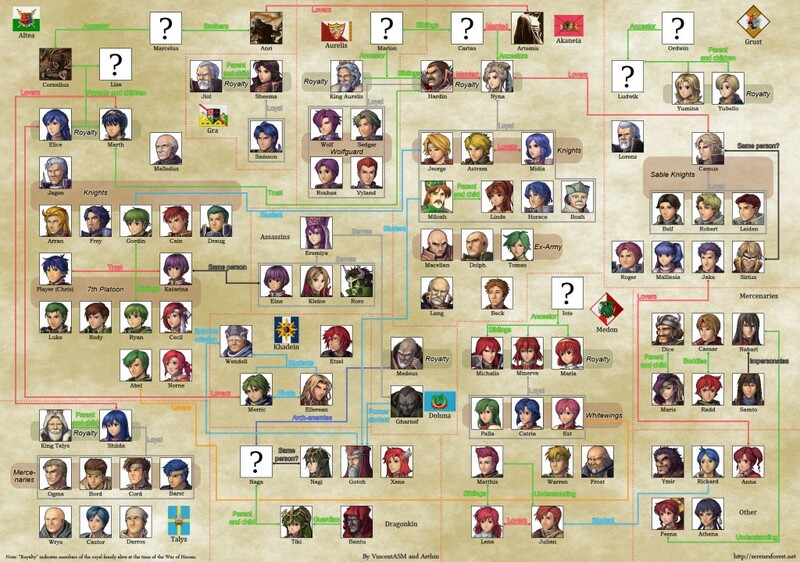 Marth’s grandfather (Marcelus’s son and Cornelius’s father) is called Marius. Fans familiar with Akaneia’s lore may notice that there aren’t any lines linking the Altean royal family to Gra’s royal family. Although common consensus dicates that the Altean royal family divided in two after Anri’s death, with one half leaving to form Gra, this was a misinterpretation and there is no evidence supporting this. What actually happened is that a “part of Altea” (which I originally interpreted as “part of the Altean royal family”), which was unhappy with Anri’s brother succeeding Altea’s throne, left to form Gra. As far as I know, there are no official sources that mention Anri having other relatives besides Marcelus or that Gra and Altea share a common lineage.